The Sony Xperia C is equipped with an 8 megapixel camera that can produce still shots with a maximum resolution of 3264 x 2448 pixels. Naturally, the Sony Xperia C camera offers all kinds of features, including HDR mode, Sweep panorama face detection, geo-tagging and touch capture. Scenes and picture effects are available too. The effects split the screen into nine segments and show a live preview of each of the nine effects, but it's a little laggy. The image quality of the Sony Xperia C photos is decent, if unspectacular. The dynamic range is low and the photos often have their highlights blown. Colors are good and the white balance is right most of the time. The resolved detail isn't that great for an 8MP camera, but it will do for most of the people anyways. HDR mode is available too, helping you bring extra dynamic range to both the shadows and highlight areas of your shot. It captures even less find detail though. The Sony Xperia C goes into our photo compare tool in the category of 8MP. It does OK on the charts and the resolved detail in close range is definitely better. 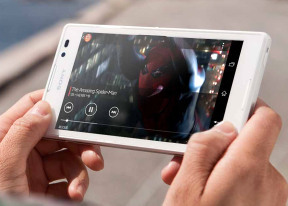 The Sony Xperia C is capable of capturing 1080p video footage at steady 30fps. You can also capture 2MP stills white capturing videos. The video bitrate of 17-18Mbps with stereo sound recording with a bitrate of 132 Kbps and 48 kHz audio sampling rate. The end results are pretty good and definitely better than we expected. There's enough fine detail, but things look a little pixelated (this could be the effect of poor image sampling). There is lots of noise too. This time around the continuous auto-focus behave well and won't be bothering you as on other Xperia phones. Here's a sample for you. And here's a 1080p@30fps sample for direct download. The Sony Xperia C enters our video comparison tool database. See how it does against some popular 1080p sharpshooters.